Procrastination is a very human trait that affects all of us at some time or other. When there’s a job or a task that needs doing that is just a bit too big, too difficult, too embarrassing or too painful, we’re all very good at finding excuses to put it off just a bit longer. Next week/month/year, that’ll be a better time to tackle that, right? Wrong, unfortunately, and it’s a habit you need to learn how to break. Apparently only around 11% of us get everything we need to get done at work each day, which demonstrates exactly how many of us take one look at our task list and immediately file some of it away as ‘one day, but not today’. We too easily pick out the jobs that we’ll get done more quickly or more painlessly and focus on those, but a new guide has revealed how to properly prioritize and get done the jobs that you’ve always been putting off. 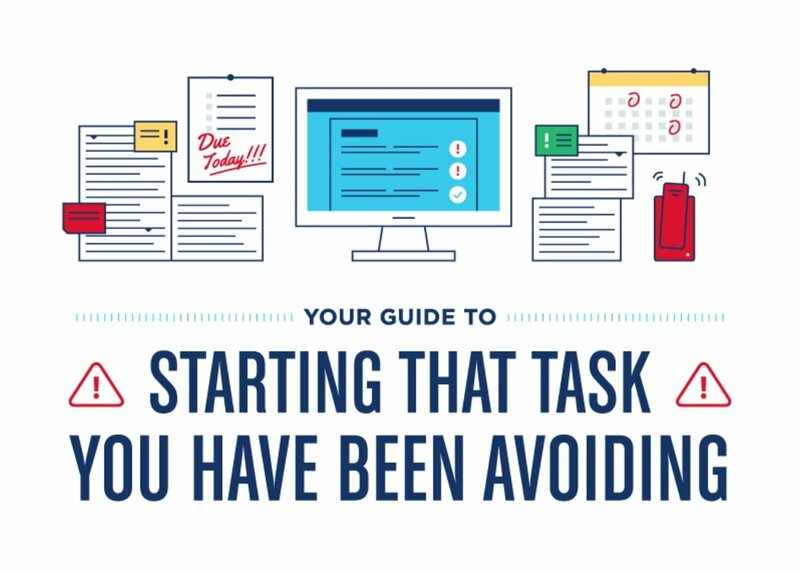 When you’re procrastinating, there’s always one small part of the task that you need to perform in order to officially kick it off, and that’s the task you keep avoiding. The more scientific name for it is the transition point,, because it’s the point at which the transition happens between it being a job you’re putting off and one you’re actually taking on instead. You might need to make a phone call to get things started, or maybe book in a team meeting. Whatever it is, get it done and you’ll feel a whole lot better. Nothing boots procrastination like a good distraction. You can set your mind to getting started at last, but then an email comes in or you receive a notification on your Twitter app, or someone you’ve not spoken to for a while comes into the office. All of these will kill the momentum you’ve tried to build up, so put some noise-cancelling headphones on, turn off your notifications, close down your emails and focus on the task at hand. ‘Ultradian cycles’ are the rhythms of our energy levels while we work. There’s certain to be a time of the day where you are firing on all cylinders and others where you maybe don’t quite doze off but certainly lose your mojo. This is perfectly natural and can’t be avoided no matter how many energy drinks you consume, so the best way to manage it is to monitor and understand your cycles, then to plan in your work to make the most of when you’re at your best. By having some work that you’ve kept putting off up to this point you’ve shown that you’re very good at delaying and convincing yourself to leave it for now. So what you actually need to do is to train yourself to fight off these impulses and listen to your better angels. You might feel anxious or inadequate if the task is big and difficult, so take a moment to consider the thought, and then use visualization techniques to picture it drifting away, leaving you ready to get back to the task at hand. Even visualization can’t help if the job you’ve got to do is looming over you like Mount Everest, so it might help you to get started if you take the time to break it up a bit. Identify where bits of work can be done as isolated mini projects and then schedule it all in, so that you’re not taking on a massive job, but a collection of smaller jobs. This will help you to not only manage your time but also to deal with the psychological pressure you’ve built up in your head around this particular task. So, you’ve finally started the project that you’ve been putting off for so long? Congratulations! But the hard work and preparations haven’t finished yet, because there’s still a lot that can knock you off course. There are distractions that will crop up, and you’ll need to acknowledge these and use breathing exercises to re-focus your energies. There’s also techniques for managing your time (breaking it into 90 or 25 minute bursts with breaks in between) which will help you optimize your energy and available working hours. You can even find the right temperature to work at - between 68 and 77 degrees Fahrenheit - to keep your mind and body alert and ready for action. There’s nothing wrong with procrastination from time to time, but when you are consistently putting off important projects, whether at home or at work, you’ll eventually pay the price. However, these tips will help you know which tasks to tackle first and help you build up the motivation, energy and resilience to power through and get that tricky task delivered on time.